Improves the movie recording process in TF2 and other Source engine games. For problems, questions or suggestions please create a GitHub issue or join our chatroom. 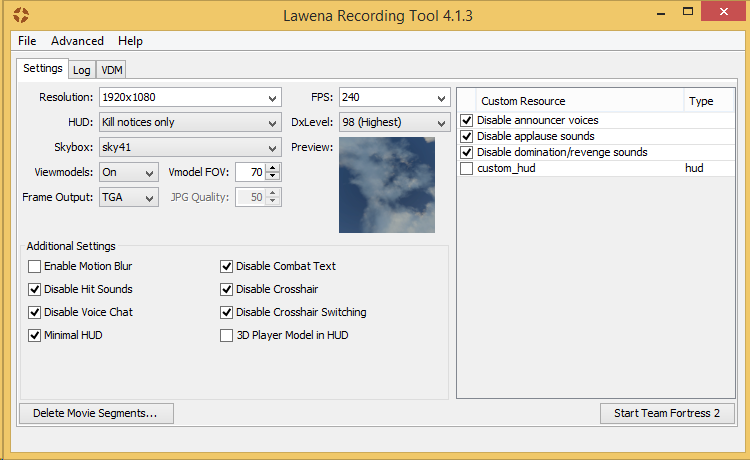 Lawena is a simple Java program that greatly enhances your TF2 and other Source games image quality for recording purposes, with little performance loss compared to other alternatives. Records using in-game Source Recorder, with key bindings to ease the process. Easy to install and use. Does not interfere with your regular configs, HUD or launch options. Check the sidebar for details. Go to Download in the sidebar and follow the instructions. If you don’t have Java installed you will find a direct download link there. Graphic .cfg files based on those made by Chris Down’s maxquality config.